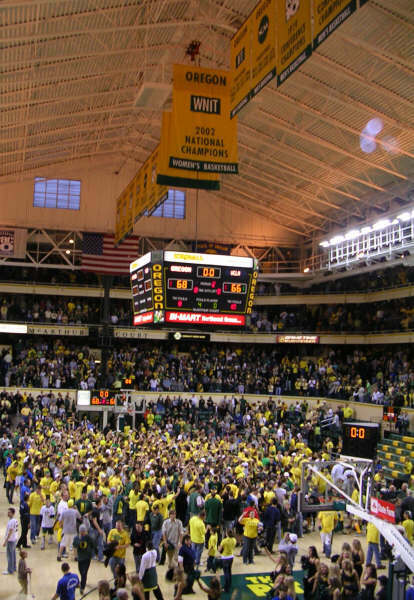 McArthur Court has been the home of Oregon Duck Basketball since 1926. Currently it is the second oldest on campus arena still in use in the entire country. On January 1st the Ducks will play their final game at the old arena before moving into the brand new Matthew Knight Arena. 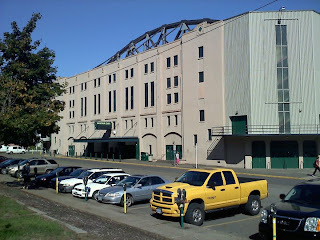 I have attended close to 100 games at "The Pit" as it is affectionately called. Saturday I will attend one final game. While I'm excited about the beautiful new arena opening up, Saturday while be sad a day because of the many memories I have of the place. I have been going games at Mac Court as long as I can remember. My dad and I would always sit in the front row of the third balcony which to this day I think is the best seat in the house. 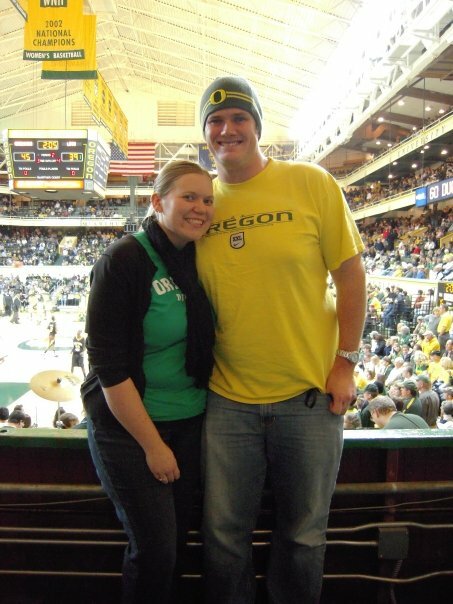 In those days the Ducks weren't very good (they still aren't), but I still loved going to games. As I got into middle school and High School I didn't many games. My dad no longer enjoyed going to games because the arena was old, uncomfortable and had many bad seats. My most memorable moments at Mac Court came during my college years. As a student I always sat in the front row of the student section. Many games I would often sit outside hours before the start of the game in order to get my front row seat. For the huge games we would barbecue and drink beverages that we weren't supposed to in public. During midterms I would often bring my books and attempt to study while waiting outside. My first Senior year the Ducks finally returned to post season play, making it to the NIT. After disposing of Georgia Tech in the first round I was faced with a dilemna. They were scheduled to host Wyoming in the second round on a Monday night. The problem was that I had a Spanish final at the same time. In the end I did what any committed fan would do and made up a story about an out of town relative that I hadn't seen in years visiting. The instructor bought it and allowed me to take the final the next afternoon. Prior to the game my photo was taken by the local paper. I remember being worried all night that my Spanish instructor would open up his newspaper the next morning and see a large photo of me at the game when I was supposedly spending time with an out of town relative. Fortunately for me the picture didn't make the paper and I passed my Spanish final the next day. My second senior year marked the return to the big dance. There were many great moments that year. First beating USC, erasing a bad memory from the year before when they beat us on a last second half court shot that shouldn't have counted. At one point a whiny USC player got a another free throw after complaining that the students were causing the basket to shake. 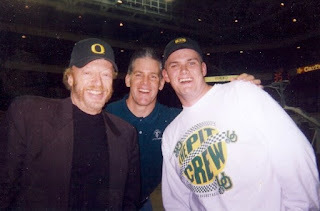 My greatest memory from that year though was the "Mac Court Miracle" in which the Ducks scored six point in the final four seconds to beat Arizona State. As Darius Wright's last second three point shot went in I hugged Nike CEO Phil Knight who was sitting right in front of me at a media table. 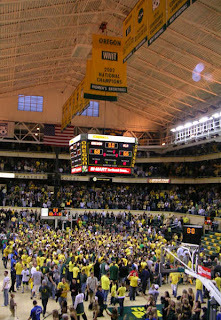 I then stormed the court jumping onto the pile of players celebrating the miraculous victory. After college I returned to the Student Section a couple times using my old student ID, but most of the time I sat in the second and third balconies where I sat as a child. The most memorable moment in my post college came in January 2007 when number 1 ranked UCLA came to town. At that game I was selected to participate in Outback Steakhouse Three Point Shootout. The goal was to make five three point shots in 30 seconds and I would win a $50 gift card at outback. The arena was full that day and preceded to shoot a bunch of bricks and air balls while being taunted by the student section. After the game I was walking back to my car when a truck passed me and someone yelled out the window "nice shooting!". The next day at church I must have had at least five people comment on my dreadful shooting performance. As for the game itself the Ducks won that day 68-66 shocking the number one team in the country. I desperately wanted to storm the court like in my college days, but I was stuck in the third balcony. Saturday will mark the last time I go to the old arena. I'm sure as I walk out of the place for the final time that I will tear up thinking about all the great memories from that place. 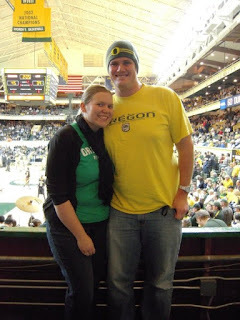 I just hope my final memory of Mac Court will be a Duck Victory. that is pretty cool Dennis to go to that many games and stuff. Have a good evening tomorrow or whenever the game is enjoy each moment and storm the court wherever you sit.